hands duck tapped to an empty beer. It looks like the skateboarding week-end was fabulous in Florida. Congratulations to Collin Graham, Sergie Ventura, Kevin Kowalski for winning their respective divisions yesterday at NSB Skatepark for Day 1 of the 2011 Florida Bowlriders Cup! There were a lot of surprises: first, Florida’s own and Demon Seed Skateboards ripper Keith Baldassare landed #1 of his category. 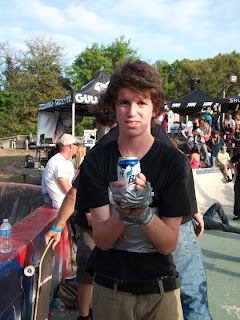 Second, congratulations to Kevin Kowalski who beat whiz kid Pedro Barros at his own game: the bowl division. Lizzie Armanto is 1st at NSB Florida Bowlriders Cup & 2nd KONA! She was #1 WCS for the year 2010 and she is keeping the same track for 2011. Congratulations Lizzie! Make sure to check out all of the video updates below and check back later for the results from Day 2 at Kona Skatepark. - Check the Interview that Alex Sorgente gaveto isTia after he won the Vans Pool Party in 2010.